As older versions of macOS & OS X no longer appear on the App Store search, how can I get any older version of a Mac OS to be able to run as a VM, or to reinstall on my Mac? I expect it to be modified over time to hopefully become a complete information resource. It would appear that in the new Mojave App Store, older purchased OS Installers no longer appear at all, so the 'simple method' of grabbing it from your purchase history is no longer valid. Sierra & High Sierra are available via direct links - see below. Testing the El Capitan installer which has a published URL it will appear in the App Store, but if requested to download no longer says 'not valid for this Mac' it now says 'The requested version of macOS is not available'. Some further testing is required - contributions welcome - to see if other OS versions are similarly removed. We may need direct links for these, which I don't have at present. For macOS versions since Sierra. Sierra itself has now vanished from everybody's Purchase History. However, Apple are keeping Sierra fully available, even though High Sierra is out. No Apple ID is required. For OS X versions from Lion up to El Capitan. The simplest way - if available to you - is to use your Purchase History on the App Store. If you have ever previously installed any OS X version, it will still be available to you from that list. This should include any public beta versions too. Image heavily modified to show only OS versions. Note, it will say Download or Install depending on whether or not you have the Installer file saved locally - even on a non-boot drive. If the version you are trying to download is older than the Mac you are attempting to download it to - the Store will not allow the download. This version of El Capitan is for users running OS X Snow Leopard or OS X Lion who would like to upgrade to macOS High Sierra. If you are running Snow Leopard or Lion and would like to upgrade to High Sierra, you need to install El Capitan first. This version of El Capitan can also be installed on computers that are not compatible with High Sierra. Note that last sentence... this version will not install on any machine that is not currently on Snow Leopard or Lion, if the machine is capable of running High Sierra. That leaves it as quite a specific resource & not a general 'get out of jail free card' for anyone wanting El Capitan. If you need to reinstall from Recovery, & were previously running Sierra 10.12.4 or higher, there are now 3 options available. reinstall the macOS that came with your Mac, or the version nearest to it that is still available. The first 2 options are available to any Mac newer than Lion, approximately 2009. There is no 'legitimate' way to download macOS from anything other than a Mac. It requires the Apple App store. Note: You can not use a Time Machine backup to revert to an OS which is older than the OS of the latest backup on that Time Machine drive. This means that to preserve your ability to ever restore to an earlier backup & OS with your Time Machine backup, you must swap out that Time Machine drive before upgrading the OS. This is because once the Time Machine drive sees the new OS, there's no going back to the older OS using it. You can still pick data out from the Time Machine manually, but cannot use it to restore to the older OS. Not the answer you're looking for? Browse other questions tagged macos el-capitan sierra install mojave . 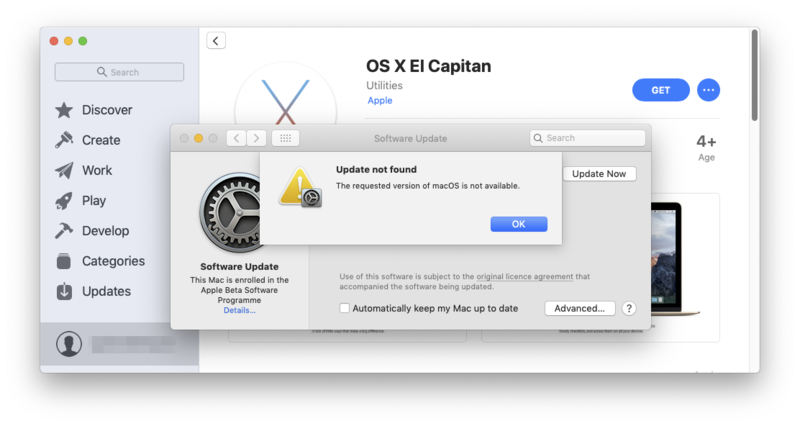 OS X El Capitan and older not available on App Store? Where can I get a copy of Mavericks after Yosimite has been released? Why can't I find OS X Yosemite in the Mac App store? How do I download Mac OS Sierra or High Sierra without an Apple ID? How to download macOS Sierra again from the App Store?